Many, many years ago I took a two day cooking class at the Biltmore Estate in Asheville, North Carolina with my mom. It was absolutely fantastic. We made many delicious dishes and it was great to learn some techniques from their chefs. They have wonderful restaurants and a bakery to die for. When they later put out a cookbook I purchased it immediately. 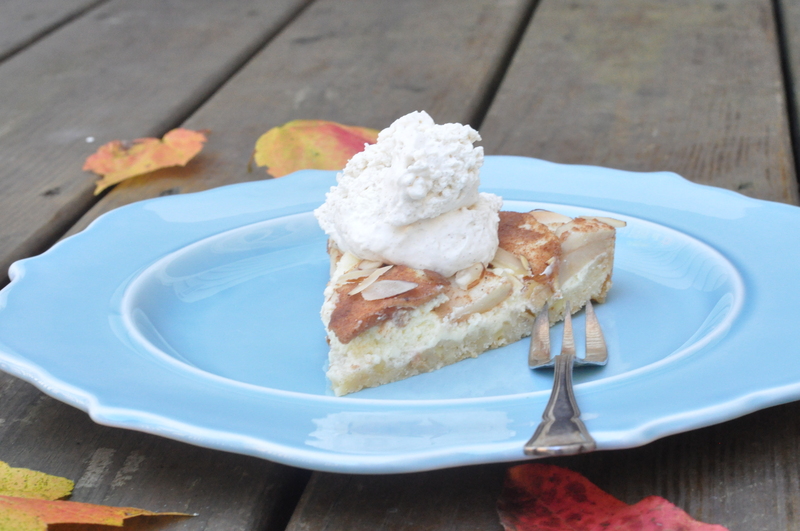 This tart recipe is based on their North Carolina Apple Hazelnut Tart. I have made that recipe many times, for play dates, dinner parties, family gatherings. Every single time it is a huge hit. Armed with apples from our apple picking outing I set out to begin making the tart. I planned on making a few changes to the recipe and ended up making one I didn’t even intend to make. I was out of hazelnuts, thus the almonds for this recipe. When I bake I primarily use hazelnuts or almonds since I can’t stand walnuts and don’t like pecans much either. The almonds did not disappoint. 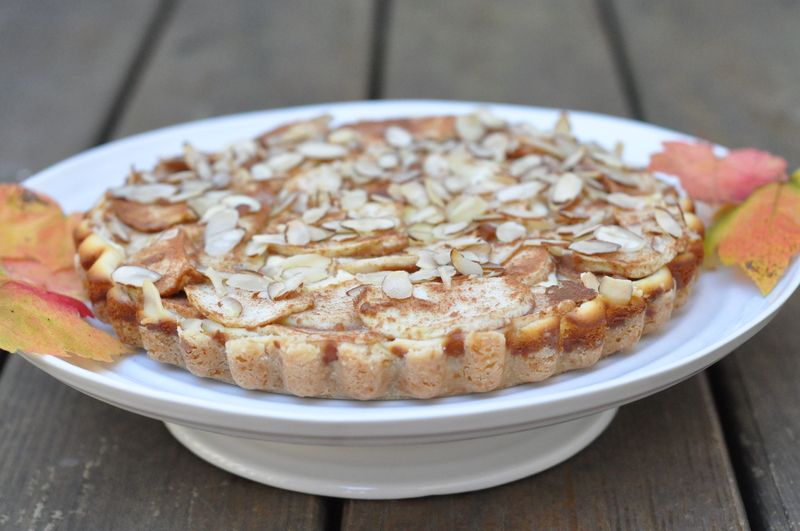 I was also excited to use my homemade hazelnut liqueur for this tart. Since I changed it to almonds I opted for my trusty biscotti liqueur. It has an almond flavor to it. You could still use hazelnut liqueur or something else, whatever you like. I just love putting different liqueurs in baked goods! I used some Granny Smith apples. Any crisp baking apple would work, or even a mixture of different varieties. 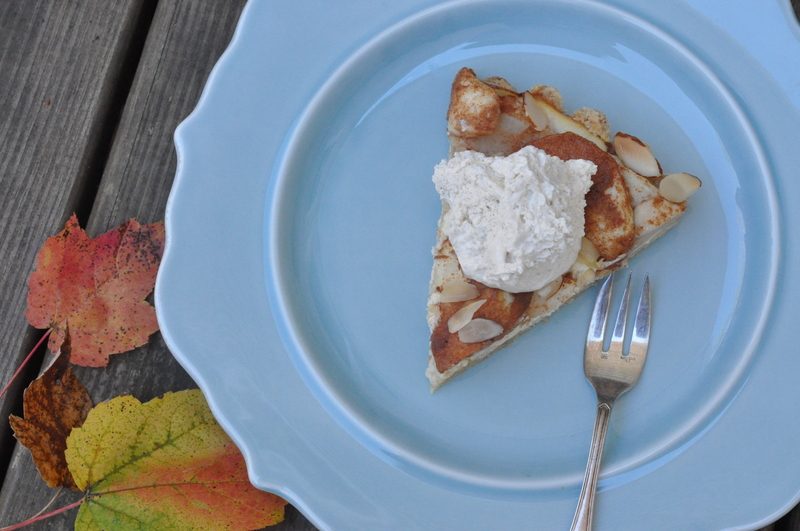 For the crust I chopped slivered almonds and on the top I used sliced almonds. Feel free to use whatever you have. 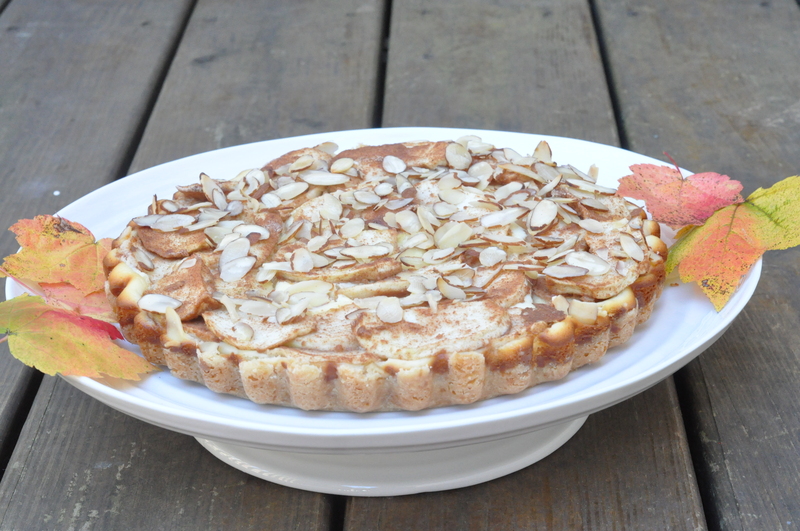 Sliced almonds would crush well for the crust or slivered works for the top. This is another recipe the boys tried to get to before I photographed it. Luckily I caught Ewan before the damage was too bad. I found him eating some of the sliced almonds off the top, look closely and you may see a couple missing! I hope you enjoy this as much as we did. Preheat oven to 350 degrees. Whisk together the first four ingredients (flour through vanilla). Cut in the butter with a pastry blender until the mixture is crumbly, resembling small peas. Press the mixture into the bottom and up the sides of a 9 inch tart pan or springform pan. Bake for 15 minutes. 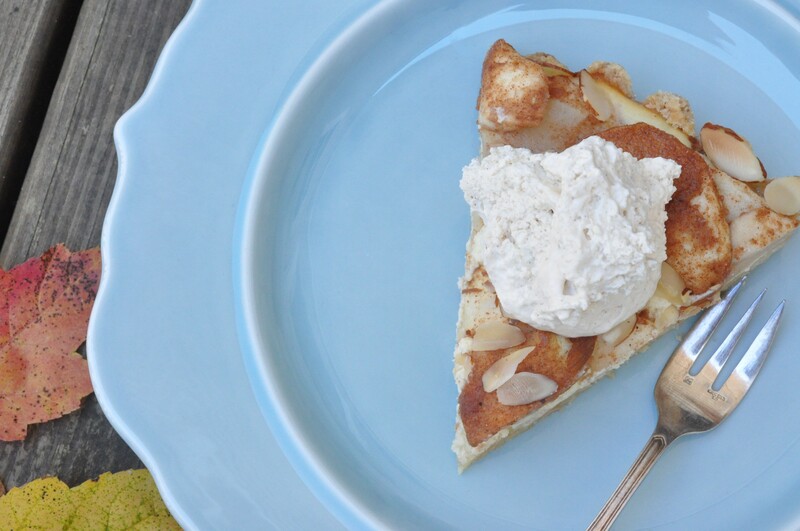 Beat the cream cheese, yogurt, 1/4 c. sugar, egg and liqueur at medium speed with a hand mixer. Pour onto the crust. Combine the flour, sugar, cinnamon and nutmeg. Add the apple slices and toss to coat. Overlap the apple slices in a circular pattern over the cream filling. Sprinkle the top with the sliced almonds. Bake for 50 minutes or until the filling is set. For the whipped cream, beat cream with an electric mixer until it becomes stiff. Add sugar and cinnamon and mix in well. Put a dollop on top of each slice and enjoy! ** You can eliminate the yogurt and use 8 oz. of cream cheese if desired. 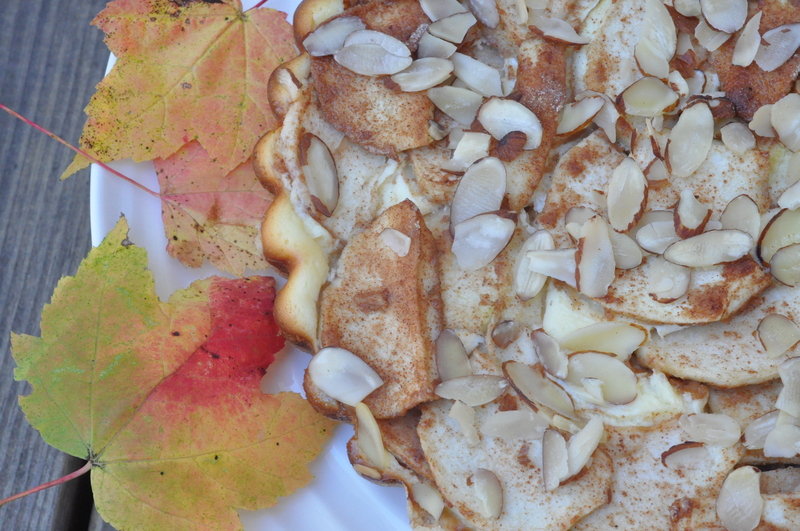 This entry was posted in Pies and Tarts and tagged almonds, apples, Autumn, cream cheese, fall dessert, tart on November 9, 2013 by Gretchen. It is quite tasty! Hope you like it. It was quite fun! The tart is so yummy. Just enough sweetness but not too much. Thanks for stopping by and enjoy the weekend. 🙂 Thank you! You, too! Glad you liked it! Feeding three boys certainly does require yummy treats! Oh my! This does look good. I think the almonds with apple is a super idea, but I’m totally intrigued by the sound of you own homemade hazelnut liqueur … amazing! How do you make that? Thanks! The liqueur was pretty easy. Pretty much soak hazelnuts in alcohol for about 4 weeks and then add a simple syrup and strain. I found the recipe on Pinterest. I also made an orangecello since I love limoncello, it was wonderful too! What to make next?!…. Reblogged this on Baking in the Burbs. That sounds wonderful and it is so neat that you got to take that class! It was a fun class and delicious tart.